In completely blowing my finish five rule, I have started two new pairs of socks. I don't feel bad breaking my rule - it was my own rule after all. I had a good reason (moving and thus the need to pack my unfinished items) and some inspiration. We are moving soon, and in the time before our move I have 3 major road trips (Chicago, Nebraska, and New Mexico). Thus I needed to plan ahead, to have knitting on hand while most of my yarn stash is packed away. 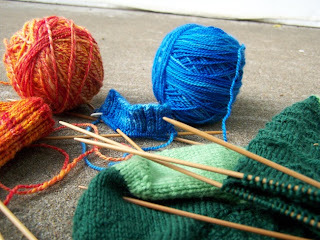 I now have three pairs of socks on the needles. When I look at the colors all together, their bright tones remind me of precious gems: emerald, sapphire, ruby, topaz. I have continued to work on the alligator socks for my husband. 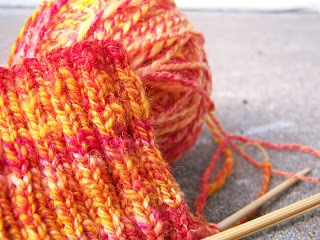 I am just ready to start the heel flap on the second sock. 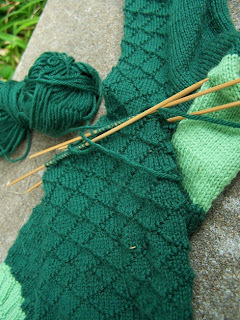 I am worried that I will run out of the dark green yarn before I am finished. 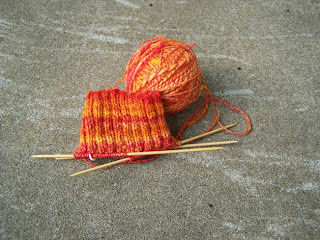 I am using the Uptown Boot Socks pattern by Jennifer Appleby. 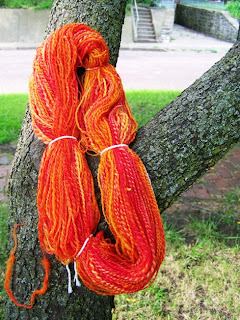 The yarn is my own handspun, from Bonkers Fiber in the Calendula Colorway. 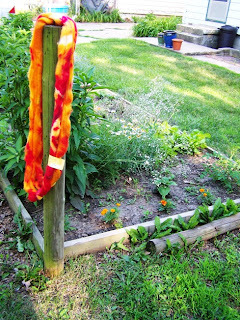 I think the yarn may be a bit overspun (or perhaps overplied) and it is not a soft as I had hoped. I also had some problems with keeping a consistent grist. But overall I am happy with the resulting yarn and I think the socks will be fine. The pattern - Nancy Bush's Child's French Socks (from Knitting Vintage Socks). The Yarn - Claudia's Handpaint in Electric Blue. 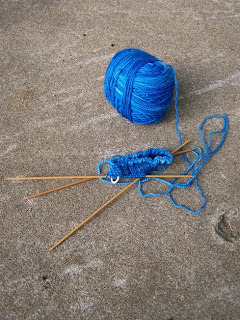 The blue of this yarn reminds me of a deep blue swimming pool, with ripples of light. I chose the sock pattern because it reminds me of the ripples created from swimming. I'm just at the cuff right now, so I will have to see if it looks like I hope.